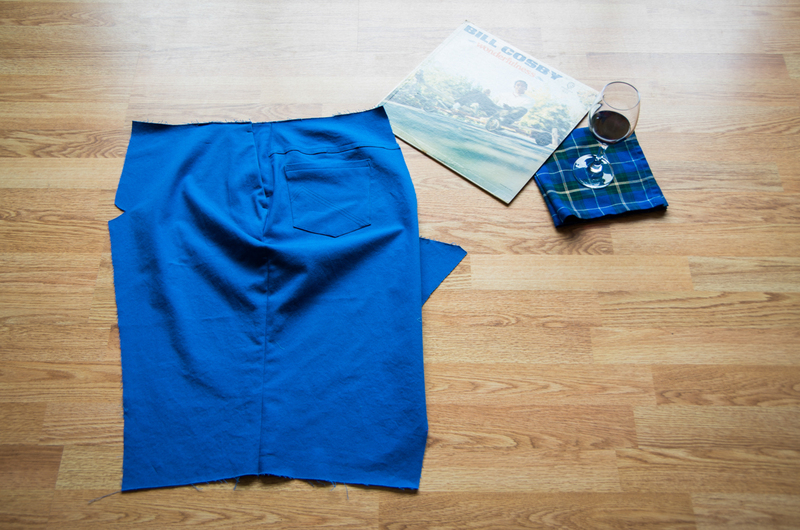 This Sunday evening a glass of wine and some good ol’ Bill Cosby will accompany us while we sew our side seams. This is my favorite of Cosby’s records and I just found the entire thing, well recorded, as a play list on YouTube for you to listen to! Woot woot! (My record is getting pretty scratchy so the YouTube version actually sounds much better). 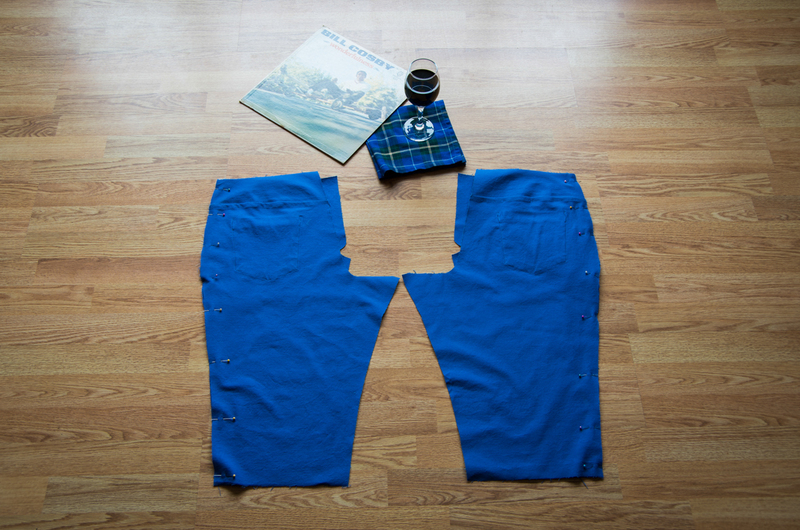 Have your shorts or pants been coming along well so far? Have you been able to keep up with the sewing or are you reading along so you’re ready to sew after the sew along is finished? I hope you are finding the photos and instructions clear! If you are confused with any of the steps so far, just leave a comment and I will do my best to elaborate on them :). 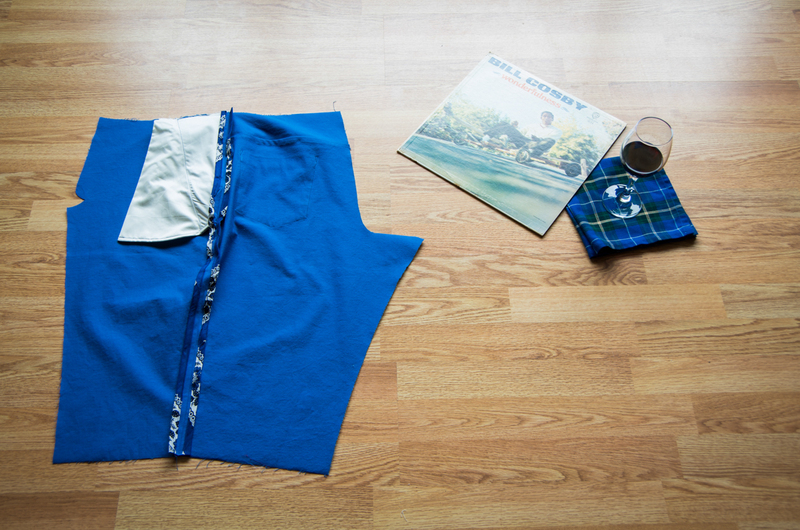 Now, lets get ready to sew our side seams – a pretty easy and satisfying set of steps! First of all, we’ll pin our Pant Fronts to our Pant Backs with right sides together along the side seam (the edge with the gradual curve). Then we can sew and press open the entire seam. Do you have your binding ready? 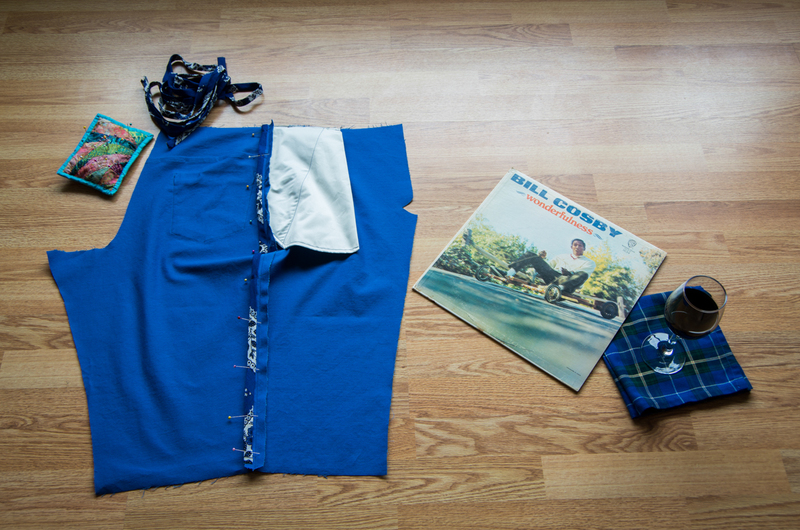 If not, here is my post on making binding from a vintage handkerchief to help you out, or you can simply use the store bought variation. You’d be surprised how little fabric it takes to make a good sized piece of binding so you could always root through your scraps and use any 10″X10″ piece of thin woven material (make it easy on yourself and choose something that maintains a crease well!). If you make extra wide binding like I did, then you will need four 10″X10″ squares worth of binding for the side seams (leaving you with a few extra small pieces that you could use later on for the zipper shield). Now we will pin the binding to one of the side seams (you can start with either the front or the back). 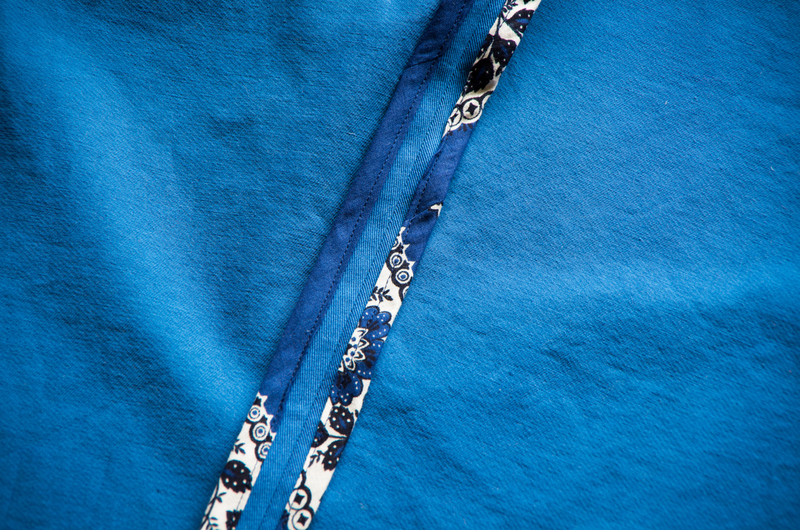 Place the narrower edge of the binding on the side you will sew so that the wider edge extends under, sandwiching the seam allowance and reaching farther towards the stitching than the narrower top piece. This will give you a bit of lee-way when you sew to ensure that you catch the bottom layer of the binding. We can now sew the first edge of the selvage and repeat this process for the second edge (and also for the second leg. Ta-da, beautifully bound seams! Won’t these look impressive and colourful when the wearer is putting on his shorts? After admiring our bound seams for a while (and giving them a final press to flatten out the binding), we can take a few steps to strengthen the front pocket area. You can sort of see the finished side seam and the strengthening stitches below but we will zoom in for a closer look in a second. 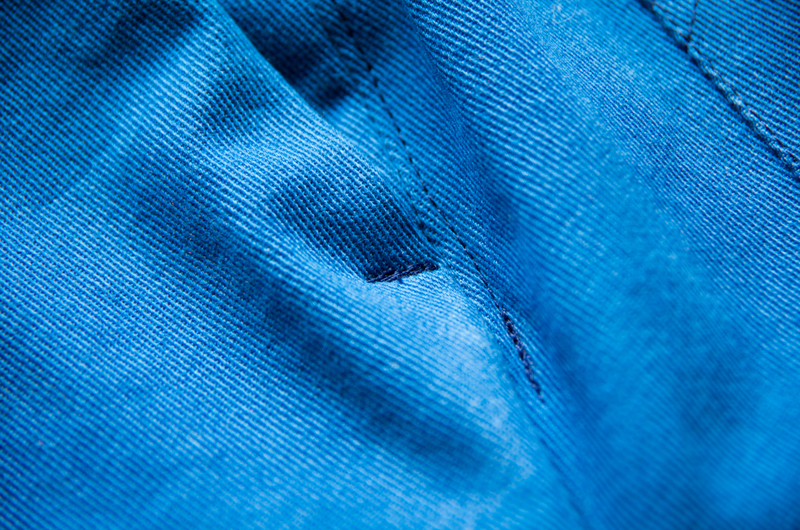 The strengthening stitches include a bar tack near the top and at the bottom of each front pocket as well as edge stitching down the side seam until 1″ below the pocket: To make the bar tacks, you can either use a very tight zig-zag (like a button hole stitch), or do what I did here and stitch for 3/8″ using a straight stitch and then reverse and stitch again…and again…and again. I’ve placed my bar tacks 5/8″ from the waist at the top of the pocket and just below where the bottom of the pocket meets the side seam. That way the pocket won’t split open or bag out when it is constantly under pressure from being filled with hands and change and keys. 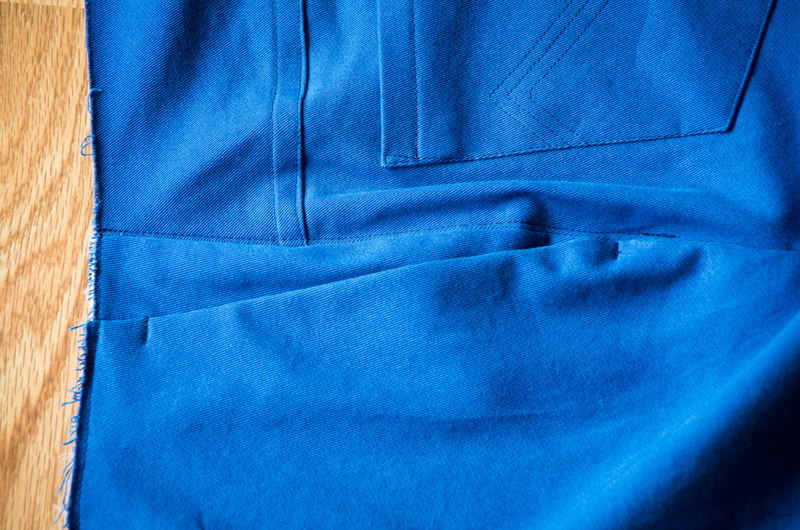 I have edge-stitched, catching the back seam allowance, 1/8″ from the side seam along the back of the pants until 1″ below the pocket. 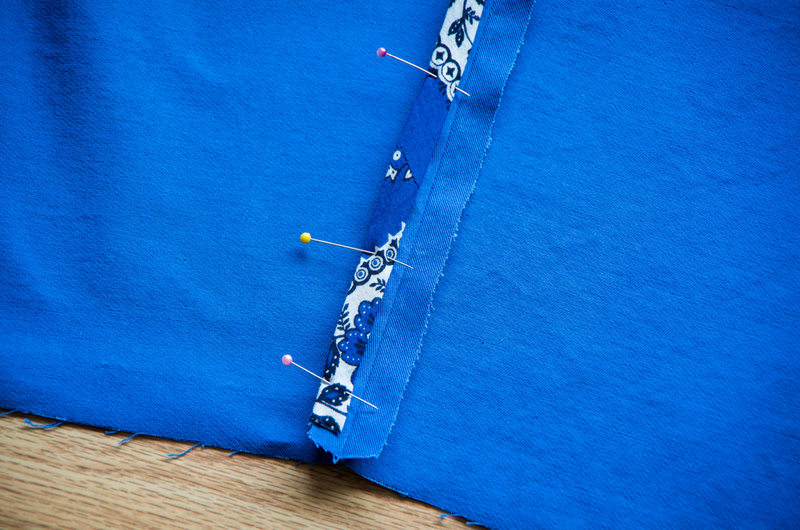 I then back-tacked for a long ways and reversed and sewed several times to echo the look of the pocket bar tacks. There! That wasn’t so bad! Now, I wonder if you will be tempted to bind EVERYTHING the way I am? It’s so simple and yet so effective (and a great way to use up scraps!). Do you like to make your own binding or do you tend to use store bought? Have you ever used one of those neat little binding tools that fold the fabric for you as you iron? I’ve never had a chance to try one but, since my binding never seems to turn out completely uniform, I certainly am intrigued. See you next Thursday when we sew the inseams! Categories: jedediah shorts, Jedediah Shorts Sew-along | Tags: sew along, side seams | Permalink. Two years later and your sew-along is still popular! 😉 It’s very helpful next to the instructions. I was wondering why you put the binding on the two seams separately? Can I also put one binding cathing the two seams together, pressed to one side (to the back ?) ? Or do you think that would turn out too thick / bulcky? I think it would look nice when the short is rolled up. I’m glad you are enjoying the sew-along! 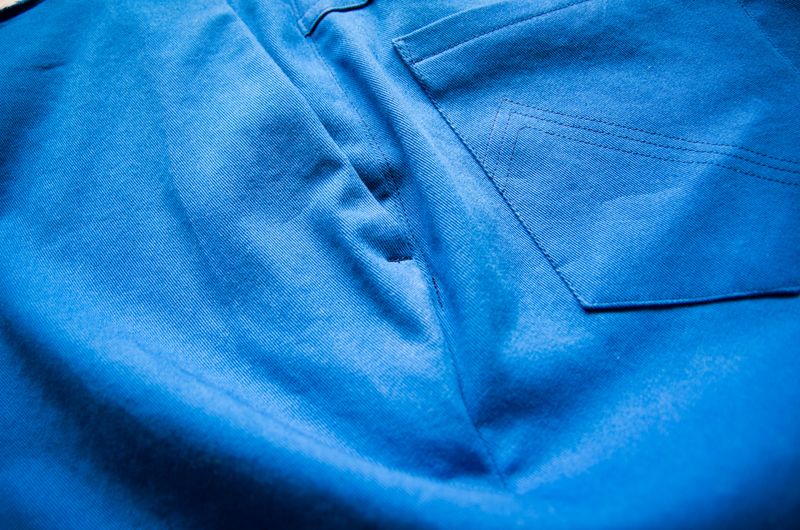 You guessed right about bulk – I chose to bind the seams separately because most menswear pant-weight fabrics are too bulky to bind the seam allowances as one. But if you are using a lighter weight material and find that the bulk is manageable, go ahead and give it a try since it would look very nice :). 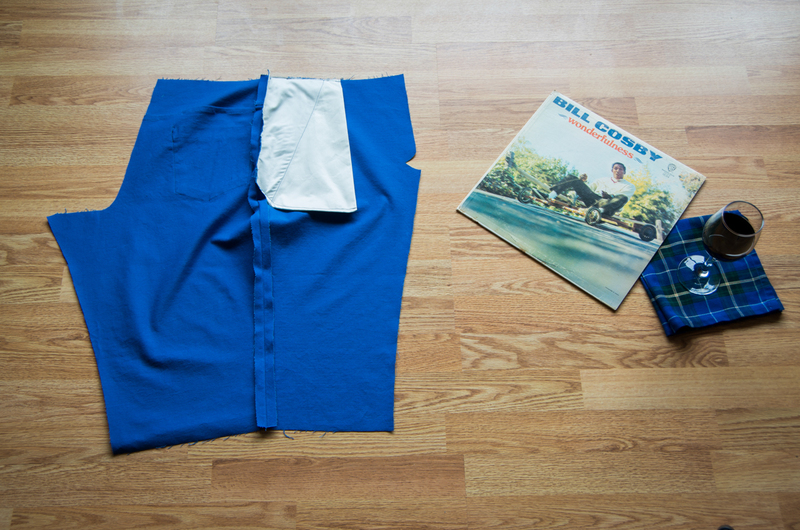 I referred to a pair of ready-made chino trousers when designing the Jedediah Pants seam finishes and they were finished with binding on each half of the seam allowance. My mother-in-law is experimenting with seam finishes on her Jedediah pants at the moment and has decided to sew a french seam on her side seams because her suiting material is quite light weight. I think this will be a very tidy finish too! Hi, I’m a little late to this sewalong, but have already made a pair before you began. Now I have 4 more pants and 2 shorts planned since we both really like this pattern. I am wondering if there is a particular reason for sewing the side seam before the flat-felled inseam? I was thinking that the flat-felled seam would be much easier to sew first while the leg is still flat, but am not sure if this effects the end result at all? Thanks, Cate. Hi Cate! 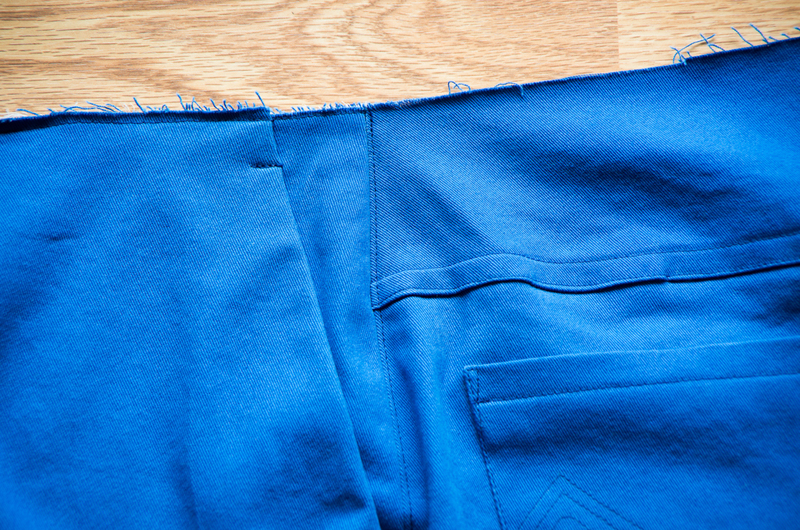 Wow, sounds like you have a lot of pant sewing in your future! I’m glad you like the pattern 🙂 Someone else also asked this question and I have to admit, the only reason I picked this order for sewing the seams is that is the way I was taught in school and so I grew used to this and never considered sewing the flat fell seam first! 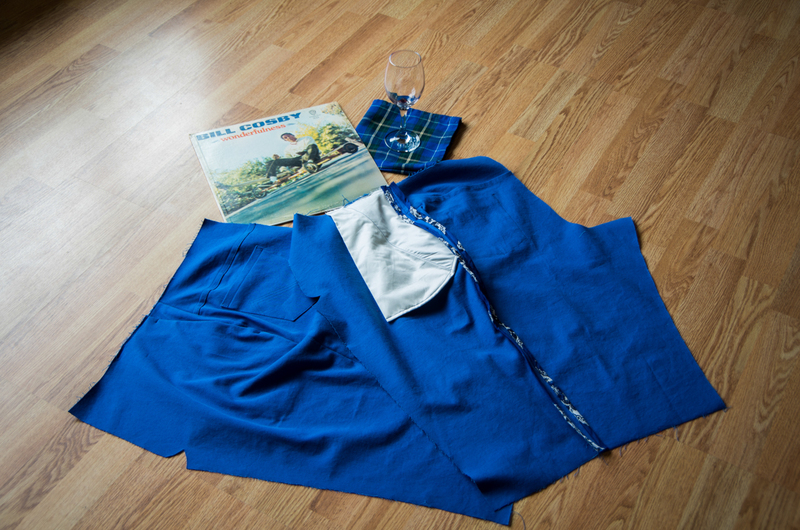 Go ahead and sew the seams in the other order, it will work just as well (if not better) – especially if you are sewing the long pant legs – that way you won’t have to sew them in a tunnel! I’ve caught up with you! So far, all of the instructions and pictures were very clear and I haven’t had any issues with any of the steps. That is, with understanding any of the instructions. I’ve had some issues, but they were all caused by my impatience and/or the crappy sewing machine I’m currently forced to work on. Some steps took me ages because I had to hand-baste things in order to get the sewing machine to behave, and I’ve had to rip out and redo some parts as well. Sigh. Good thing I’m determined to finish this! Also, I think that I should probably have paid more attention to trimming/grading my seams, because this thing is really bulky in some places. And I should probably also have used even lighter fabric for my binding. Oh well, we’ll see what my boyfriend thinks once it is actually a pair of shorts that he can try on. Oh, and I rather enjoy your beverage/snack and music pictures. Just figured I’d finally mention this as well! As for grading and binding thickness – those are good things to keep in mind for your next pair. I have had similar issues with binding that is too thick in the past when I tried to make binding out of self fabric which happened to be a fairly heavy duty linen and I was frustrated to no end with it! Next time, try as thin of a cotton as you can find (I’m loving how easy to iron and how thin the binding is that I have been making from handkerchiefs) and I think you will find it so much easier to deal with! Thanks for commenting on the beverages and music…it has been fun to document the drink level getting lower when we photograph each step :)! Oh yes, I’m currently looking into finally getting my own machine. I only started to sew less than a year ago and taught myself on my mum’s lovely and very reliable 1970s Husqvarna—but she needed it back, so now I’m working on my boyfriend’s parents’ machine, which is a cheap, crappy and temperamental 1980s Singer that has not, as far as I know, ever been serviced. It has only straight and zig-zag stitches, doesn’t back-stitch any more, and doesn’t like to edge-stitch (or zig-zag finish) anything. It’s a pain, but I don’t think it would be worth it to fix this thing, so I’m just trying to find work-arounds to my issues for now. I should hopefully soon either get my own machine, or be allowed to borrow my mum’s again. 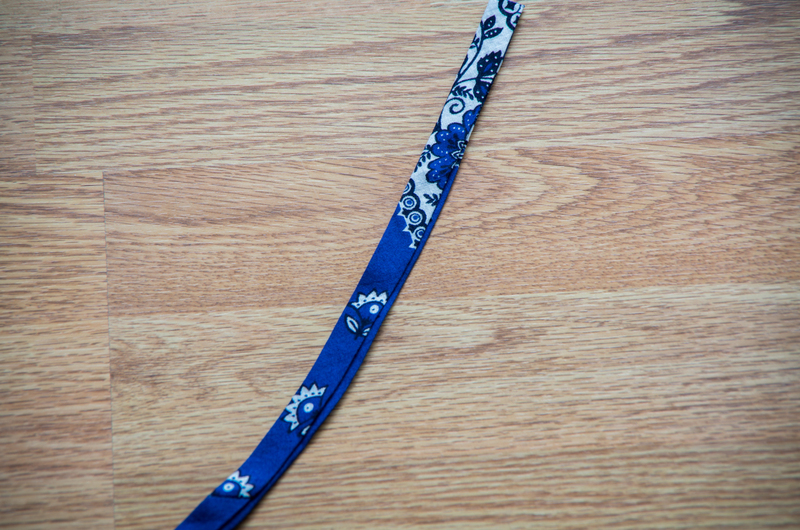 I should totally splurge on some Liberty lawn or something like that for the binding for the next pair! That would be such fun. Looking forward to the next “lesson”!